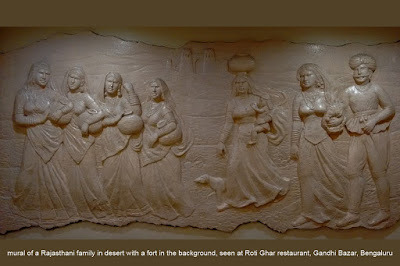 This lovely scene of a Rajasthani family in desert can be seen at Roti Ghar restaurant in Gandhi Bazar, Bengaluru. The mural is wide, almost double the width of what's seen here. The unseen part includes other features of desert.. camels and all. Kudos to the artisans who created this lovely piece of art. 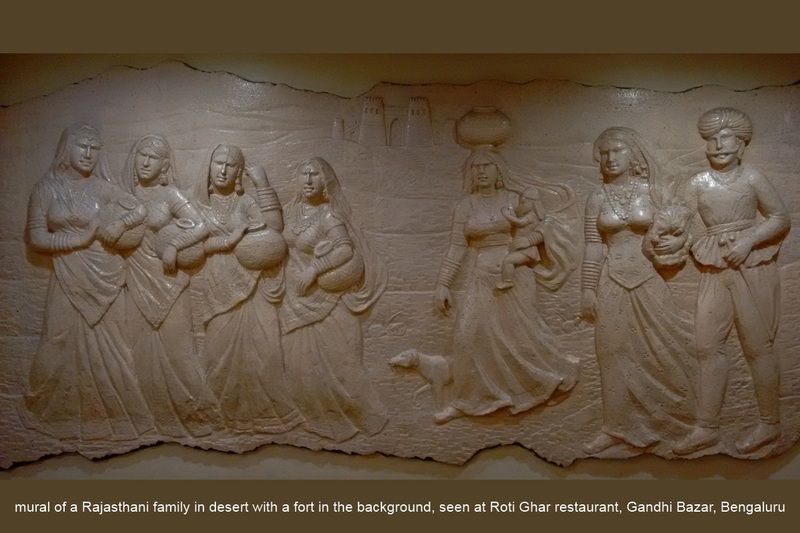 Kudos to Roti Ghar owner to have encouraged the artists. This picture made me to remember a fruit vendor, whom i had seen at my grand parents place, she belonged to Lambani/Lamaani community, who used to dress like the woman with man as depicted in the picture. Lamani Thanda (Lamani ommunity's living place is called as "Thanda") was near to my ajja's home i cld see women dressed in this way, now a days i haven't got to see women dressed like this at my ajja's place, may be now the dress too has got an honour of traditional dress and is used only on Ethnic day. As i admitted earlier too, many times your posts rekindles those memories, they may be significant or insignificant, fond memories brings a breeze with it.